This handy pack contains a dual USB car charger that means you can charge 2 devices at the same time. It also has a fast charger function for added convenience. The pack includes a micro USB cable, 8 pin USB cable (both 1 mete long) and 30 pin USB adapter for Samsung Galaxy Tab and Apple devices. It also features a 2.1A power outlet. It makes the charger compatible with many tablets, mobile phones, eBook readers, cameras as well as USB/micro USB devices. 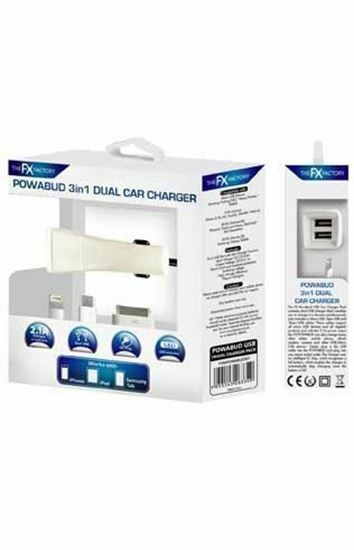 The FX Factory POWABUD USB car charger pack, for example, is ideal for charging the iPhone 5/5c/5s/4, Touch 5, Touch and Nano as well as the iPad 2nd, 3rd and 4th generation and iPad Air. You could also use it for Samsung Tab tablets or Samsung Galaxy/HTC/Nexus phones and tablets for example. Simply plug in the USB cable into the POWABUD and plug into your cigarette lighter socket. The charger uses an intelligent IC chip, which recognises a full battery and enables the charger to automatically stop charging once the battery is full. Features also include short circuit and overload protection and high charger efficiency.